Monday to Friday from 9:30 a.m. to 2:30 p.m. The Standards Library is a specialized library storing and maintaining the collections of standards and other normative documents with the accompanying catalogues, periodicals and databases, which you can use to search data on standards and other documents in the field of standardization. Users can get, free of charge, an insight into the Standards Library holdings, access to all available information, use of four computers and professional assistance of the Library's staff in defining their requirements and searching. HZN, ISO, IEC, CEN, CENELEC, ETSI, DIN, BSI, etc. HZN Glasilo, ISO Focus, CEN/CENELEC/ETSI Bulletin, DIN Mitteilungen, BSI Business Information, ASTM Standardization News, etc. 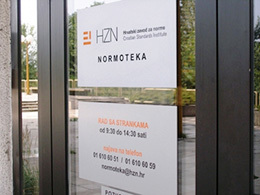 ISO Management Systems, Accreditation and Quality Assurance, Metrologia Ambalaža, Brodogradnja, Drvo, EGE, Elektroenergetika, Elektrotehničke instalacije, Energija, Hrvatske šume, Hrvatska vodoprivreda, Mineral, Nafta, Plin, Tekstil, etc.